Summary: Folks, God will send a blessing to many because of the prayer of one. But how much better would it be if all of us here, and the entire Church of God, were stirred up to pray for God’s kingdom. Text: "O Lord, hear; O Lord, forgive; O Lord, hearken and do; defer not, for thine own sake, O my God; for thy city and thy people are called by thy name. "—Daniel 9:19. 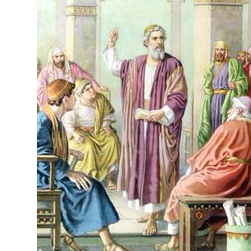 DANIEL was a man who held a high government position in the kingdom of Babylon. He was taken as a slave from Palestine, but, by the will of God, he had been raised to a high office in Babylon. So, it shouldn’t be surprising if he had forgotten his less fortunate country men. Unfortunately! Some of us might have known those that have even forgotten their poor fellow Christians, because they thought they were too good to worship with their former less fortunate friends and family when they themselves had become better off. But it wasn’t that way with Daniel. Even though he had been made a high official of the empire, he still thought of himself as a Jew. When he saw the misery of his people he felt miserable, and he thought that it would be an honor for him to share in their suffering. However, he couldn’t do that since God had made him important and had blessed him with wealth; therefore, he couldn’t make himself as poor and as hated as they were. But he had to do something, so he prayed for them and pleaded with God to end their misery. However, Daniel was not only a man with a lot of authority; he was also a man with very high spiritual values. He was thankful and happy because God had blessed him, but he was sorry for those of his people who suffered from the brutality of the Babylonians. Folks, it’s discouraging to me that so many Christians believe they are blessed by God, and yet they look down on Christians who are less fortunate than they are. People who think like this are mistaken in the opinion they have of themselves. Daniel showed his sympathy for his poorer and less fortunate countrymen by praying for them. And, he probably showed his sympathy in other ways, but this time he showed it by interceding for them with God. Let’s look first at Daniel’s--MODEL PRAYER. The first thing I want to say about this prayer of Daniel’s is that it was not made without giving it some thought. He didn’t offer this prayer like some people do, as if it was something that didn’t require any prior thought. We have been taught to prepare before we give a speech. But, we have never been told to prepare before we speak to God. Have you ever thought that it might be a good idea to prepare your heart, before you open your mouth to speak to God? Don’t you think we often begin to pray without giving any kind of consideration to what we are going to say? But, Daniel's preparation started when he read God’s Word. He had with him an old copy of the book of the prophet Jeremiah, and he read it through. Folks, I wish I studied my Bible more than I do! I wish we all did! You may have told a man, when you ask him to do something for you, "You said you would do it." And, God is also obligated to keep His word, that is, the promises He made in His Holy Book. So, when we pray, we can mention His promises and that they give us something to look forward to, and then ask Him to fulfill them. If you study God’s Word, your prayers may burst out of your knowledge of scripture, and then you will pray a Daniel like prayer. But, will you notice next, Daniel's prayer was mingled with a great deal of humility. It’s always good for us to express humility when we speak to God in prayer. We always pray our best prayers when we pray out of the depths of our heart. Sometimes, when we reach a low point in our lives, we can pray with more passion as we plead our case to God. It’s sin that takes us down to the low level of sinner. We need to see as much of our sinful condition as God will allow us to see of it. Folks, God will send a blessing to many because of the prayer of one. But how much better would it be if all of us here, and the entire Church of God, were stirred up to pray for God&#8217;s kingdom.